It is late September and the temperature is daily climbing to the mid to high 30’s, no rain since April so everything is very dry and it is just the right time to dig down the well in the garden! Mr Hitra arrived on Wednesday with a shortened pick axe and a bucket on a rope and dug down another 2 meters until he found a good strong spring source which he assures me will now last all year round. Today we put the electric pump down to extract enough water so he can line the newly dug wall with bricks and then hey presto! – water all year round for the garden and washing. The water we drink is brought from a nearby bore hole which taps the aquifer and much less subject to bugs –even so, I still boil it. So different from home! 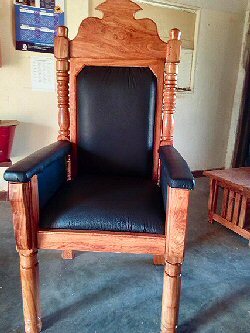 The Chair made for the enthronement of Choma Mayor! I thought of calling this newsletter from mayor’s chairs to mambas, since they have been part of a very diverse few months since I last wrote to you. I think everyone will have had Jane’s wonderful letter about the play4all girl’s adventure in Sweden, and how they just missed the semi-finals of the Gothia world cup. I never realised we had such amazing talent and am already thinking how we can get them out next year. A BIG BIG thank you to everyone involved. We are also very pleased to get another volunteer called David Horch. David is 22 and recently qualified in Mechatronics (a hybrid of electrician, welder and engineer) has been seconded to us by Bread for the World in Germany. He will be here for a year and already has proved his worth mending and improving some of our ancient carpentry machines in the workshop. Another most welcome but unexpected arrival will be Liton Mosumder, another mission partner who has been in Zambia with his wife for 11 years. I received a text about a week ago from head office and he arrives on October the 1st with his wife, who will work as a nurse at Njase, the UCZ school down the road. This is a very gracious answer to an “unprayed for prayer” if you know what I mean, as getting a qualified accountant at Chodort was way beyond anything I could hope or ask for - or afford! Another event which has been very engaging has been the arrival of the container from Containers Ministry in Ireland run by the Methodist Missionary Society Ireland. 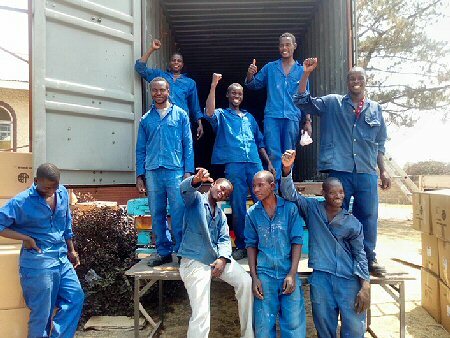 We are extremely grateful for all the hard work and logistics that have gone into sourcing and packing the goods for this container, which is divided between Chodort and a St Joseph’s hospital (about 150 km away). The container arrived at the weekend and was emptied and moved off the lorry all in one day. The small problem was that both cranes in Choma are out of order, but Mr Kalumba, the Vice Principal saw a crane lorry passing through town, flagged it down and persuaded the driver to do the job on his way back from Livingstone that evening! As well as lots of useful items for the workshop and a brilliant new photocopier great books for the presbytery and UCZ college, there are loads of things which are useful in the catering skills room on the new college site. The catering course starts in January 2017. Our instructor, Mr Akafumba Akafumba is very keen and has already done one short refresher course for table service with another planned in October. He also has a regular spot on a local radio station and recently took his students along to give their views. It greatly amused me to hear him ask them “so what do you think of your instructor?” – all positive answers of course! Oh, and the mayor’s chairs and mambas? The special chair for the Mayors inauguration was made from a photo in less than a week, - well done Vincent and the carpentry team. 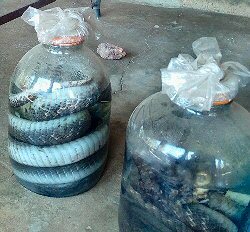 The mambas are safely tucked away in formaldehyde in glass jars after being shot on the farm where I go riding. They were spotted by workers and Emma was asked to deal with them. Thankfully I haven’t seen any live ones on my rides. Thank you all again for your support, your prayers and thoughts really do matter. For a peaceful inauguration of President Lungu this month, after a rather fractious election battle. Jane and the volunteers faithful work with the children of Kamatipa. For our new accountant Liton Musomder. For keeping carpentry production with plenty of orders. For the container ministry and all their good work. For the successful outfitting of the skills room ready for January’s intake of students. That Liton and David will fit into Chodort life and enjoy their time here. For the computer class to update its equipment. 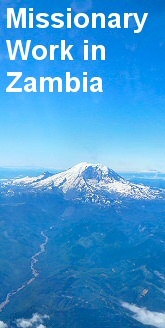 For the Zambian economy, still facing 20+% inflation, with all that means to the very poor.